When a beehive grows too large for one queen to handle, the hive will create a new queen via royal jelly, and the population will split roughly in half, with one half taking the new queen and leaving to form a new colony elsewhere. This fairly vulnerable collection of honeybees is called a swarm, often containing hundreds or even thousands of bees. 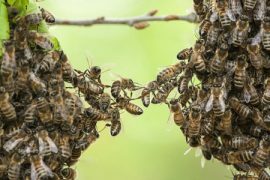 This is why people hear about random, giant swarms of honeybees being spotted in populated areas — on tree branches, in abandoned shacks, or inside of metal bicycle tubes, usually looking like something out of an old horror movie. A couple from Leicestershire, England had one such experience after a mysterious sticky substance began leaking from their ceiling. This substance turned out to be honey from a very large honeybee hive. This couple was shocked to find out that a displaced swarm had taken up residence in their 18th century home’s attic. When honey began appearing in the house’s light fittings as well as numerous bees flying around the place, they found the hive and immediately called a local beekeeper to help them deal with the problem. Roberts stated that honeybees and similar pollinators, such as particular species of bumblebees, love the types of dark, high up, and secluded spaces offered by an attic. For homeowners concerned about keeping swarms out of their attics, consistently check the roof and ensure there aren’t any gaps where bees can fly in. If this does happen, however, homeowners should avoid engaging the bees or spraying them, instead calling a beekeeper, who can take them away to a preferable, safer location.